Sir Joseph Wilson Swan, D.Sc.h.c., FRS (31 October 1828 – 27 May 1914) was a British physicist and chemist. He is most famous for his role in the development of the first incandescent light bulb. Swan first demonstrated the light bulb at a lecture in Newcastle upon Tyne on 18 December 1878, but he did not receive a patent until 27 November 1880 (patent No. 4933) after improvement to the original lamp. 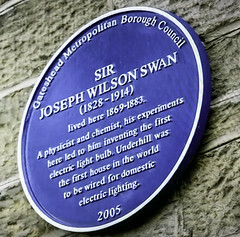 His house (in Gateshead, England) was the first in the world to be lit by lightbulb, and the world's first electric-light illumination in a public building was for a lecture Swan gave in 1880. In 1881, the Savoy Theatre in the City of Westminster, London, was lit by Swan incandescent lightbulbs, the first theatre and the first public building in the world to be lit entirely by electricity. In 1904 Swan was knighted by King Edward VII, awarded the Royal Society's Hughes Medal, and was made an honorary member of the Pharmaceutical Society. He had already received the highest decoration in France, the Légion d'honneur, when he visited an international exhibition in Paris in 1881. The exhibition included exhibits of his inventions, and the city was lit with electric light, thanks to Swan's invention. Swan was the maternal grandfather of Christopher Morcom, Alan Turing's close friend and first love during their studies at the Sherborne boarding school. 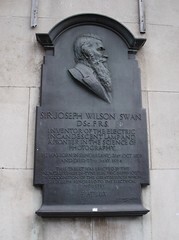 Sir Joseph Wilson Swan FRS (1828-1914) Chemist, physicist and inventor of the incandescent light bulb which he first demonstrated at a public lecture here on 3 February 1879. Nearby Mosley Street was the first street in the world to be lit by such electric bulbs. Sir Joseph Wilson Swan (1828-1914) lived here 1869-1883. 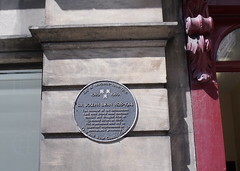 A physicist and chemist, his experiments here led to him inventing the first electric light bulb. Underhill was the first house in the world to be wired for domestic electric lighting. Sir Joseph Swan 1828-1914. The inventor of the incandescent light bulb joined John Mawson’s chemist and druggist firm at 13, Mosley Street, in 1846. His experiments here led to important improvements in photographic processing.